Sometimes a little kind-heartedness goes a long way. When Patrick Tucci watched his 11-year-old son Ian board a recent Alaska Airlines flight, he couldn’t hold back the tears. For Ian, one of the consistencies of traveling between Seattle, Washington and Orlando, Florida is flying Alaska. But this flight was a little different. Tucci says he wanted to be strong for Ian after he left, but seeing his son leave is never easy. Meanwhile onboard the aircraft, Seattle-based flight attendant CJ Jensen introduced herself to Ian and helped him stow his backpack. First Officer Justin Meisberger had seen the tearful goodbye between Tucci and Ian after his aircraft walk-around, so he asked Jensen to bring Ian up to the cockpit. “I knew the goodbye was just as hard for the dad as it was for the son,” said Meisberger. Capt. Brian Good told Ian they could call his dad from the flight deck. 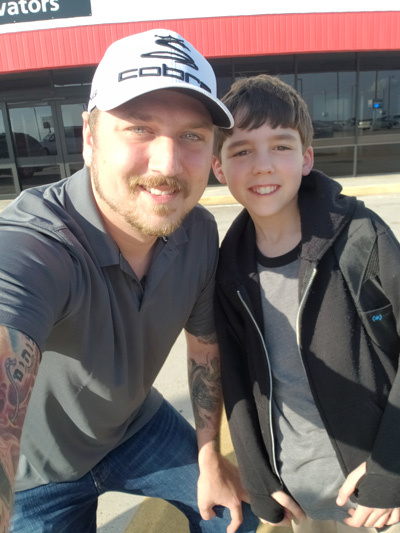 “Since Ian didn’t have access to a phone, Brian called Ian’s dad on his personal cellphone,” Meisberger said, adding that he held on to Ian so he could lean out the window and wave to his dad. Tucci said he was sitting next to the window looking out at the plane when he received a call from an unfamiliar number. After waving goodbye to his dad one final time, Ian returned to his seat while Good and Meisberger prepared the aircraft for departure. Good complimented Meisberger on his big heart, but he insisted it was a team effort. We’re thankful for the entire crew, who worked together to brighten a father and son’s day.